Defense attorney Alan Karow walked out of court in Paso Robles on Sept. 17 feeling victorious. A San Luis Obispo County Superior Court judge had just ruled in favor of two of his clients, both Hmong-American farmers growing cannabis in the California Valley. On Aug. 8, San Luis Obispo County had received authorization from a cannabis hearing officer to abate the growers' plants and impose fines. Karow then filed lawsuits challenging that. Judge Linda Hurst's decision that morning placed a temporary stay on the abatement orders so she could hear further arguments. The stay could hold just long enough for his clients to harvest their crop, Karow thought. "Those two are hopeful things will work out," he said after the ruling. Then he checked his cellphone. While Karow was in court, county officials went and abated the cannabis of another Cal Valley client, whom Karow was about to file the same legal action on behalf of that day. It looked to him as if the county was pre-empting the court process, cutting down the plants while they still had the opportunity. Such is life in the topsy-turvy Cal Valley right now, where cannabis grows proliferated a few years ago amid cheap land and a lack of local regulations and where SLO County is currently attempting to enforce a blanket ban against them that was passed late last year. As autumn harvest season reaches its peak, some growers are escaping with a crop to sell while others have fallen to an enforcement system that's led to dozens of abatements and nearly $1 million in fines levied. Since May, the county has held regular cannabis enforcement hearings, where it tries to obtain abatement orders based on public nuisance determinations. In the quasi-judicial process established this year, an outside officer hired by the county oversees the proceeding and makes a ruling based on the evidence presented. As of press time, the county had held 14 hearings where all 59 rulings tipped in its favor, and $849,700 in cumulative fines were issued to growers, according to a New Times analysis of county data. Karow represents the Cal Valley Growers Cultural Association, a community of about 60 Hmong-American medical cannabis farmers who, Karow says, have essentially invested their livelihoods into their grows. Many are first generation Americans who don't speak English. According to Karow's lawsuits, two-thirds of all the growers brought to the county's cannabis hearings are of Southeast Asian descent. He said that violates the equal protection clause of the Constitution. "They came here in search of a better life," Karow said. "They invested everything. Most of them will lose all the money they have." Karow's core argument is that the county set an unreasonable timetable for the growers to comply with regulations that have changed over time. In September 2016, SLO County supervisors adopted an urgency cannabis ordinance in which Cal Valley growers could cultivate as long as they registered with the county. Then in November 2017, supervisors adopted a new ordinance that completely prohibited growing in Cal Valley. Karow argues that not only did the county make a 180-degree turn in the policy, officials had conducted site visits under the first ordinance where farmers were required to invest in fencing and other materials on their properties to continue. "By pulling the rug out from under them, they basically let a lot of these people invest every penny they have, only to take that investment from them and say you can't do anything with it," Karow said. "But worse than that, to fine them thousands and thousands of dollars for acting in a way in which they were approved to do." Karow said he's earned three court-issued stays on abatement orders in those cases, which have allowed those growers to harvest. He's not the only one challenging the county in court. SLO resident Will Powers Jr. has filed a lawsuit aiming to reverse a cannabis officer ruling against his son's alleged Cal Valley grow, as well as overturn the county's cannabis ordinance. Powers said he's seeking a jury trial to rule on the constitutionality of the ordinance. "The key to all of this is due process of the law," Powers told New Times. 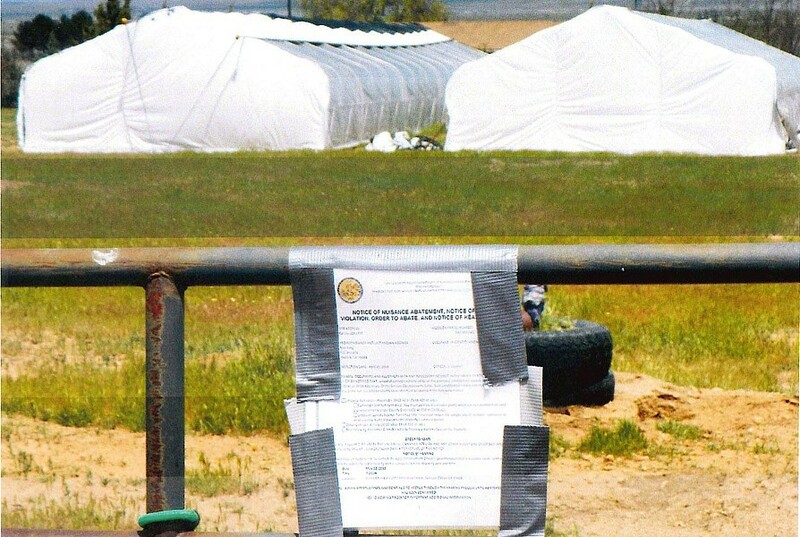 "When you get an abatement notice, it says you're in violation [of county code]. You look at that ordinance and it's 62 pages and somehow you're supposed to know what you're in violation of. That's not due process." One longtime resident of Cal Valley, who asked to remain anonymous for safety reasons, argued that the time is long overdue for commercial cannabis to leave the valley, a remote and environmentally sensitive area home to several endangered species and limited water resources. "The county has made it very clear that the urgency ordinance was only temporary and would be in effect only until the permanent ordinance was adopted," the resident said, echoing arguments made by county counsel. "No one was taken advantage of, misled, or deceived by the county."